Modern and textured sterling silver ring with Australian opal doublet and gold ball accents along the top and bottom of the opal, as well as one on each size of the band. 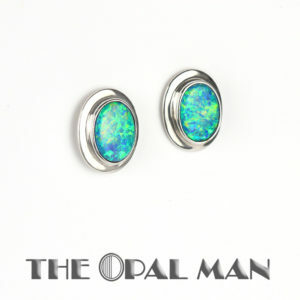 This opal is a stormy blue with shocks of green which goes great with the hammered look of the band around the bezel. Ring size: 10.75 — Please call with questions about ring resizing. There is also information about resizing in our “Terms and Conditions” page.